I’m excited to be the host for a stop on the World of Ink tour for Alicia Lloyd’s book When The Monsters Are Quiet. Welcome Alicia. Congratulations on your book. What age range is your book for? Alicia: My book ranges from a first to second grade reading level. However, I work with three and four year olds on a daily basis and they comprehend the book and its meaning as well….it is awesome! Alicia: Yes, I had the majority of Dr. Seuss’ books memorized. I chased my family out of the house because they didn’t want to hear me recite “The Cat in the Hat” word-by-word anymore. Kai: That’s adorable! Tell us, how you think life has changed for children today than when you were that age? Alicia: Life has changed drastically, I believe. First of all, with in regards to reading, children can now flip through the pages of books electronically. I don’t know if it is because of my age and I was used to physically holding a book and flipping through the pages, but my preference to this day is to still hold a book. I am only 22 years old and I have kids in my daycare who are showing me how to access books on their Kindle. However, I think it is awesome that there are now applications where children can download a game that looks interesting to them and practice vocabulary, sentence structure, or reading. They are learning and practicing reading strategies while having fun and I am ALL for that! In a general perspective, I think kids today have a lot more to worry about than I did. They have to be cautious of their surroundings at all times and get outside more to play; when they get older, they are going to miss the care-free times of going outside to play…and nap times! Kai: I agree. Kids seem more sheltered now because of the safety concerns. It’s a shame fewer kids have the freedom to walk to a corner store for a bag of chips or a candy bar. How is life still the same? Alicia: Life is still the same because kids are still afraid of monsters! Kids still have an awesome imagine. Kai: What inspired When the Monsters Are Quiet and how did you decide on this age range for your story? Alicia: I don’t have the same, inspiring, story as every other author. Sometimes that worries me but I am proud of my own story. It is unique, for sure. In the summer, I was sleeping in a new place for the night. We were actually helping my boyfriend move into his new place. I, at the age of 22, woke up alone and heard a bunch of unfamiliar noises and scary sounds that I didn’t like. So I texted my boyfriend, Chris, telling him I hate his house and I am never coming back! I finally fell asleep and later woke up to a text message from him saying, “Did you ever fall back asleep?” My response was, “Eventually, when the monsters were quiet.” I kind of tossed that phrase in my head for awhile and thought it would make a cool children’s book title. Later that week, on a Saturday, I woke up at 3 o’clock am and wrote the last two lines of my book and the first three. The next day, my boyfriend and I were driving somewhere and I opened my “notepad” application on my iPhone and referred back to my story that I started. My boyfriend is 6’5 (very tall) and he was signing Selena Gomez’s song “Come Get It” obnoxiously and at the top of his lungs. Somehow I finished the book right next to him in that car ride. I then put on Facebook, “Who knows the steps to a publisher?” And my neighbor commented and recommended Halo Publishing. I looked it up, saw an option to submit my manuscript, typed it in a word document and sent it away. I never thought that anything would come out of it and I wouldn’t hear a call back. Luckily, the next day Lisa Umina from Halo Publishing made my dreams come true and we started the process. Kai: Oh my gosh, that’s a GREAT story! Okay, finally, I have four kids. Over the years they’ve attended a lot of birthday parties. I love the idea of building a theme gift around a book. If you were to give a gift basket to a child based on your book, what else would be in the basket besides When the Monsters Are Quiet? This friendly book is a fun way children can start to become proficient readers by reading about one of their biggest worries- bedtime! This book is a reminder to never be afraid of your monsters and has helpful hints for parents to help their children by exploring with early reading strategies at home. Kai: Please share with us where our readers can find more information about you and your book. 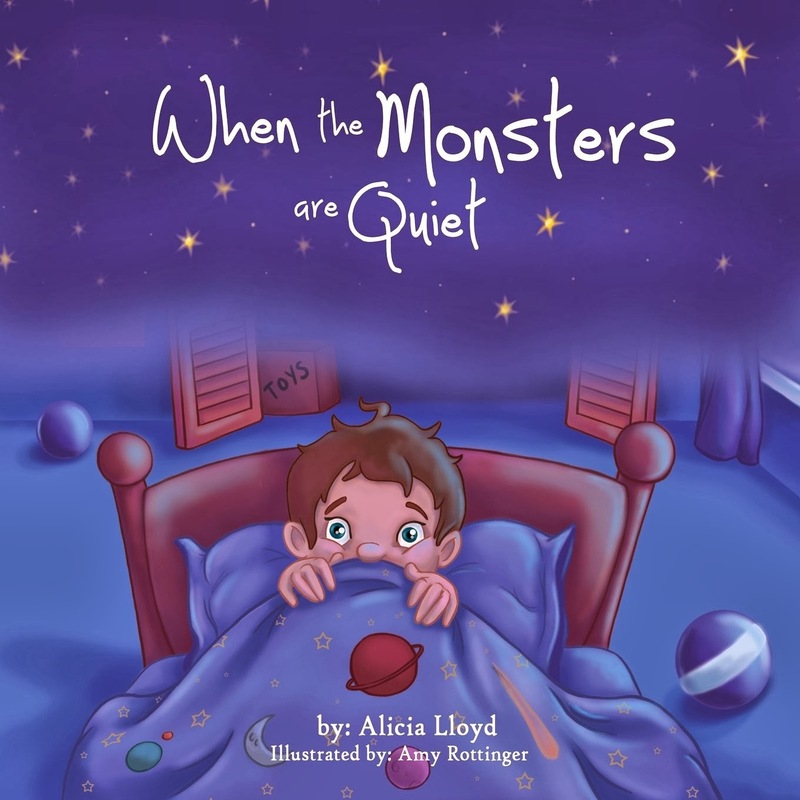 Alicia: Readers can like my page on Facebook: When the Monsters are Quiet- by Alicia Lloyd. That is where I post all my upcoming events and new information. My book is available online in 40,000 databases in over 100 countries. These databases include: Amazon, Barnes and Noble, eBay, and Halo Publishing International’s website. Alicia Lloyd is a senior at West Chester University of Pennsylvania and is working towards her Bachelor’s Degree in Early Grades Preparation (PK-4) and Special Education. She has a strong passion for working with children and loves to write! Alicia lives in Oxford, Pennsylvania surrounded by her wonderful friends and family. Thank you for joining us today, Alicia. Best of luck to you and When the Monster Are Quiet. What a great interview! Congrats and best of luck with your book Alicia!! !